El S-1800 Super-Stamp de Super-Krete®, es es un colorante base agua. Color Stain está formulado en 20 colores a elegir y proporciona un acabado natural y fresco tanto en superficies viejas o nuevas como en interiores o exteriores. Color Stain es traslúcido por lo que las superficies tratadas no tendrán apariencia de pintadas. Se logran acabados muy similares a los ácidos sin los riesgos y peligros de toxicidad y manejo especial. Color Stain es excelente para lograr acabados viejos en concretos lisos, estampados o texturizados. Es muy versátil. Color Stain se utiliza con rociador a baja presión. Super-Krete S-9500 Color Stain achieves a decorative acid stain look without the hazard or special handling. Color Stain is a water-based, penetrating, non-acidic, acrylic/urethane emulsion that creates a natural look on new and existing surfaces. Color Stain is durable and protective. It can be brushed, sprayed or sponged on to create even, mottled, or marbleized effects. 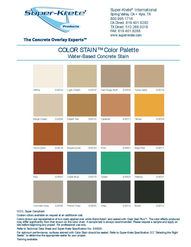 Color Stain is available in 20 standard colors. Custom Colors are available upon request. Color Stain is an easy application and requires a water clean up. Super-Kretes waterbased Color Stains are user-friendly and beautify concrete and Super-Krete surfaces with very little effort. 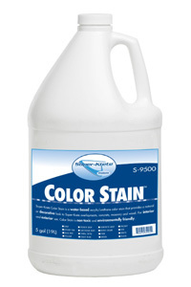 Containing no chemical or hazards, Super-Krete Color Stains are the alternative to acid stains. With water based Color Stains, you can mix and match colors to achieve your own look. Colors can be mottled out or marbleized. They can be applied by a variety of methods including brush, broom or sprayer. No rubber gloves or ventilation equipment are needed! And the colors are true, what you see is what you get. There are no chemical reactions with the contents in concrete, so you can expect to see the results you are trying to achieve without worry. 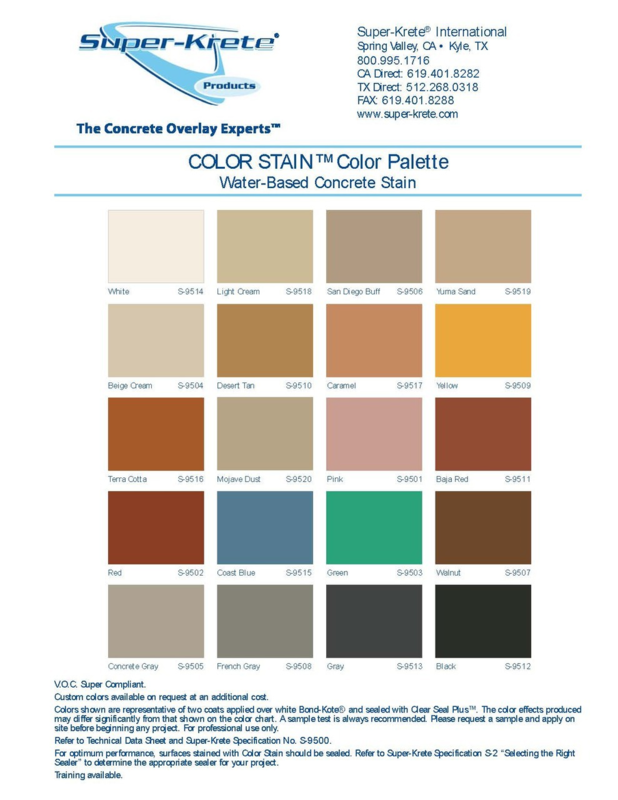 Enhance any concrete or Super-Krete surface by adding color. It is helpful to have your client sign off on a sample board created and kept by the installer in advance of the actual installation to be sure that the clients need are being met. 1. Mist the stamped area with water and apply Super-Krete Color Stain using a broom, sponge, roller, brush or filtered airless sprayer. 2. Shake the Color Stain container well (do NOT dilute) to ensure that all contents in the product are thoroughly mixed. If using a sprayer, filter the stain with a strainer before pouring the stain into a sprayer. It is best to pour half of the contents into the sprayer base, shake the container again, and pour the remainder of the product into the sprayer base. 3. Spray Color Stain on to the surface. Apply Super-Krete Color Stain only with a filtered hand pump sprayer or airless sprayer. Set airless sprayer at lowest pressure setting and use nozzle of sufficient size to prevent atomization. Use a soft flag tipped broom to further spread material and provide uniformity. When applying Color Stains, always use lighter colors as a base first and highlight areas if desired with darker colors. When highlighting areas for contrast, always make sure that the base color has dried (is not wet) before applying highlight colors. When mixing colors before they have dried, the colors may blend together to form all new colors. This can be done, but be sure it is the effect you are trying to achieve. Lines and joints can be enhanced using a hand-held dustless grinder or diamond blade, and can be grouted for a more dramatic appearance and to add dimension. Grouting should be done between sealer coats. Apply stain in a light, even coast to lightly dampen surface only. Do not soak surface and dont allow to puddle. Follow immediately with a soft, flag tipped broom to further spread material. Allow first coat to fully dry (approximately one hour) and repeat application method until uniform. Two to three coats may be required to achieve desired finished colors. Apply lighter colors first, allow to dry, and then highlight using darker colors. The sprayed color will flow into the low areas and create depth and enhanced texture appearance. For heavier traffic areas, stain according to the standard application. Allow a 24 hour cure time. Return to apply a minimum of 2 coats of Super-Krete VOC 93 Clear Sealer S-8800. Spray Super-Krete Color Stain directly on the substrate broom to spread the color. Spray a light mist of water. This will remove broom lines and will also aid in the spreading (mottling) of the color. Spray apply the highlight color, and then mist with water to spread (marbleize).